Like a kid at Christmas, I jumped out of bed and put a new Vibram Fivefingers KSO on each foot. More accurately, I took several aggravating but intriging minutes getting each toe into each CORRECT slot in each barefoot shoe, and then slipping it onto the rest of my foot. I could feel the left bit toe as before, but it was right on the verge of being ok or not. So just to be on the safe side, I grabbed my receipt, got into regular shoes, and went to the shoe store. They still had my old box, and were happy to trade me in for a bigger size. Somehow, it took me even longer to get my toes into the right places. Like, a lot longer. I was thinking a size bigger would be perfect, but I was surprised, they were worse! My right (smaller foot) was way to small in a 45. On the left, the end of my big toe came to the edge of the rubber that wraps around the top. So as I walked, the tip of my toenail flipped irritatingly across the rubber edge. This would not do. I tried the 44 back on, then the 45. I usually worry about annoying the salesperson, but I was determined to get this right! Six times back and forth, and it became clear that the bigger 45's were much worse for me than the 44. So out the door I strode in my 44's. They felt much better on my feet after the size 45 pair. At this point I was confident that I just had to break in the barefoot shoes, and my feet. I walked about 30 minutes on concrete, very aware that I was warned to do a little bit more every day and let my feet adjust. But it was comfortable, even though I could feel the solidness of the concrete. • It was not uncomfortable walking on concrete. I naturally avoided a hard heel strike. And it felt totally doable (though I wouldn't want to walk all day long on concrete, not yet anyway) to walk a good distance on such an unforgiving surface. • The bottom of the shoes protect the bottom of the feet from roughness and everything that keeps me from walking barefoot on pavement and asphalt. I could feel the solidness and contour, but none of the roughness I would feel if my tender bottom of the foot skin was on such a surface. 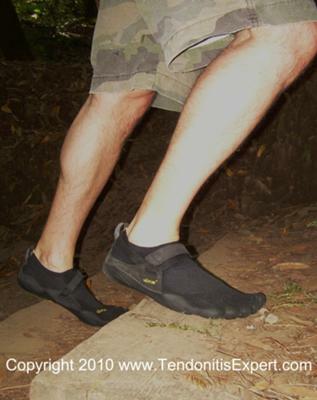 • With the lack of padding I'm used to in my shoes, my feet felt like they might get bruised from the hard concrete, but I also noticed my stride and foot strike automatically adapt. I was clear I just needed to get my feet in 'barefoot shape'. Please reply using the comment link below if you have anything interesting your want to share. Return to Vibram Five Finger Reviews.